Pumpkins are everywhere now that it's Fall, and many of us are using them throughout our home as decor or attractive dinnerware, but have you ever made a cake in the shape of one? Last week I decided to make my first pumpkin-shaped cake for a Halloween party as a surprise for guests, thinking it would be a piece of cake to do. Well, it was and it wasn't. The first order of business was to take out my pumpin-shaped cake mold out of storage, and get it ready for baking. This wonderful, heavy cast-aluminum cake mold was produced exclusively for the Martha by Mail catalog many years ago, and I was fortunate to have purchased one when they were around. I'm glad I finally decided to use it. This past month I wrote a post about the mold providing all of you with the recipes and detailed instructions for making the MBM version, right from the recipe card. The cake ingredients looked good, so I went with it. Although I didn't create the jack-o'-lantern design that is pictured on the recipe card, I did make an adorable pumpkin cake cloaked in a burnt-orange glaze, which was given a green-colored marzipan stem as an accent. A pumpkin-shaped cake can be baked and iced for any fall occasion. You don't need to reserve this delicious cake for a Halloween spectacle, because it can be served alongside the pumpkin pies, apple cakes and other desserts that many of us will make for Thanksgiving. Filled with tasty pumpkin puree, and flavored with a bevy of spices, the Martha by Mail recipe is bound to be revisited at some point in the future. What I have to confess to you here and now is that I encountered a problem during the cake making process, but it was all due to a mistake on my part. It was a humbling moment for me because I thought the cake was ruined and I would have to start all over again. We've all had those experiences when baking things that just didn't turn out the way we thought they would. These mistakes or bumps in the road are teachable moments for all of us. Don't worry, I'll give you some tips to prevent you from encountering the problems I had. It's all in the name of learning from one's mistakes! Whenever I bake anything, it's important to have my mise en place near the mixer, if I'm using one, so that I can make the dessert without having to pause or stop for an ingredient. Using some yellowware bowls and an extra KitchenAid mixing bowl, I divided my ingredients up for the pumpkin cake. Recipes for cake batters may call for the addition of stiffly beaten egg whites to lighten the batter. 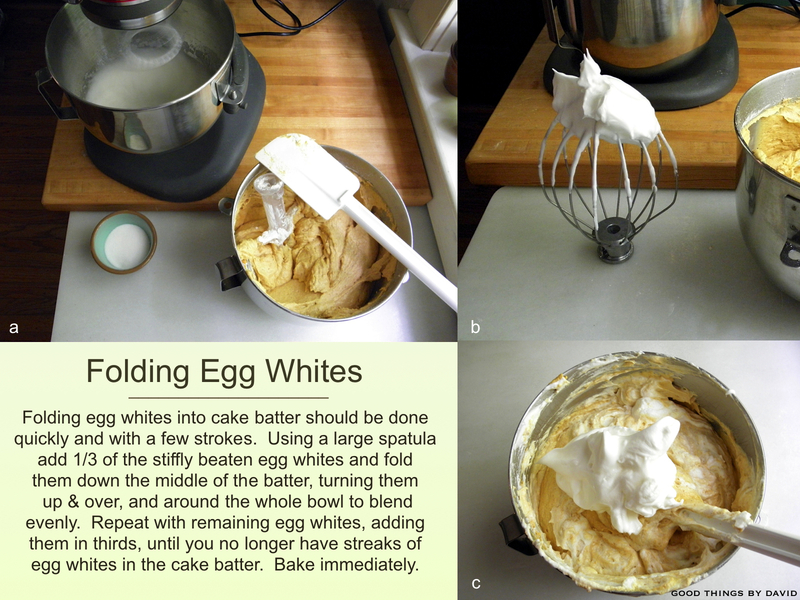 Folding egg whites is a technique every baker should master. You start by adding 1/3 of the beaten egg whites to the batter, gently cutting them down the middle with a large spatula, turning the batter from the bottom, up & over the egg whites. You continue doing this until the whites get folded in completely. Most recipes call for adding the egg whites in thirds. What I should have done was to fill the mold halves no more than 2/3 full of batter. Having been in a rush, I used up all of the batter (which, as you can see, is almost to the top of the 5qt. mixer bowl) and divided it evenly. WRONG! The arrows that I've placed in the photo, on the molds, show you where I should have stopped filling. This cake batter is lightened with a lot of egg whites, so what ended up happening about 45 minutes into baking was that I found a souffléed cake which was spilling over the molds. YES! Thankfully I had the rimmed baking sheet underneath the molds so that the excess could spill onto it, but still, it was unsettling to watch this. Rather than taking out the cakes, I let them continue baking. In fact, they ended up taking at least 2 hours of baking rather than the 1-1/2 hours. I thought this would dry out the cake, but it did not. In fact, the baked cake was very delicious. Long story short: fill the molds no more than 2/3 full and bake the cake with a baking sheet underneath (just in case) for a solid 2 hours. Make cupcakes with any leftover batter. Look at what my molds looked like underneath when I turned out the cakes. Messy! Nevertheless, the cakes came out intact and beautiful. Once cooled, I placed them onto a rimmed baking sheet and chilled them thoroughly. I would go so far as to suggest that you freeze the cakes until they're solid before you decorate them. Since the cakes are exceedingly tender, they need to firm up before you handle them. Note: the bottoms of the pumpkins need to be trimmed on a 90 degree angle while they are cold so that they stand up when finished, and not topple to the sides (they bake at a slight angle because of the mold). An orange-colored butter & milk glaze was made to cloak the pumpkin (I made this without consulting a recipe) and I whipped up some heavy cream, flavored & sweetened with pumpkin spice and vanilla sugar (1/4 teaspoon of spice to 1 cup of heavy cream), to sandwich the cake halves. The cakes were glazed on a cooling rack set over a rimmed baking sheet, and they were then sprinkled with clear sanding sugar to give a glittered pumpkin effect to the finished cake. These were then given a thorough chilling in the refrigerator until the glaze had hardened. Any excess drips were trimmed before assembling. I placed one half of a glazed pumpkin cake onto a cardboard cake round, set on a caramel glass cake stand (also Martha by Mail), and I began to spread the whipped cream on the inside. Both halves were gently sandwiched together and I then filled the crevice between the halves with more whipped cream. With some leftover orange glaze, I poured it over this area in order to mask the halves and give the effect of a solid cake. With some sanding sugar, I sprinkled it to make it even with the rest of the cake. The entire cake was then chilled in the refrigerator. Last, but not least, was the stem of the pumpkin. I started out by adding some avocado gel food coloring to a small amount of marzipan, and then I kneaded it to get an even color. Use gloves when working with marzipan because it is sticky. I had some forest green coloring in case I wanted a deeper color, but I was happy with straight avocado. It was only a matter of shaping the stem and giving it a ridged texture, making sure I pulled some of the marzipan out to create a flat base with which to rest it on top of the cake. It's never too late to learn something new. My lesson here is to remember that I can't rush the cake making process and that I need to pay attention to what I'm doing. Will I make a pumpkin-shaped cake again? Absolutely. Will I learn from my my mistakes and not repeat them? You better believe it. At the end of the day, I was very pleased with my results and the guests enjoyed this centerpiece-worthy dessert. I hope that you profit from this lesson on making molded cakes, and if you happen to have the Martha by Mail pumpkin cake mold, by all means use it and make a pumpkin cake this fall. As I said, live and learn!